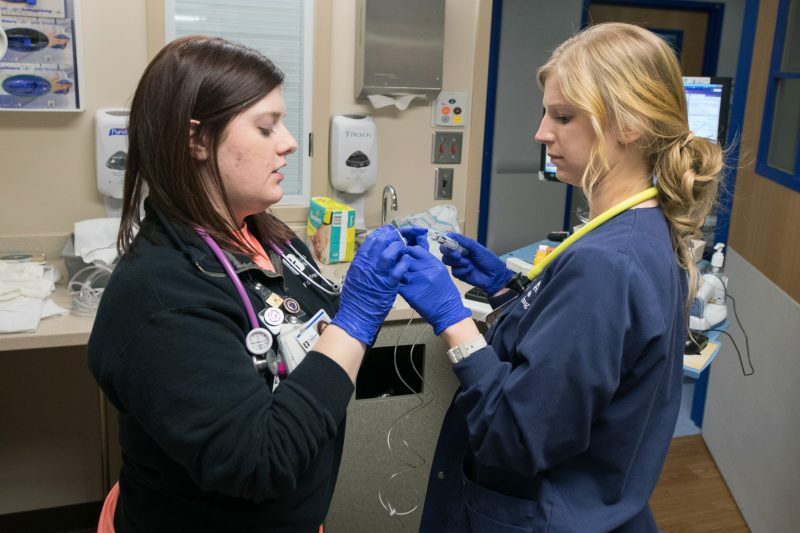 Renee Carver shows her nursing student, Kristina Peters, how to administer vitamins through a syringe. Certified Registered Nurse Renee Carver takes a lot of pride in what she does. 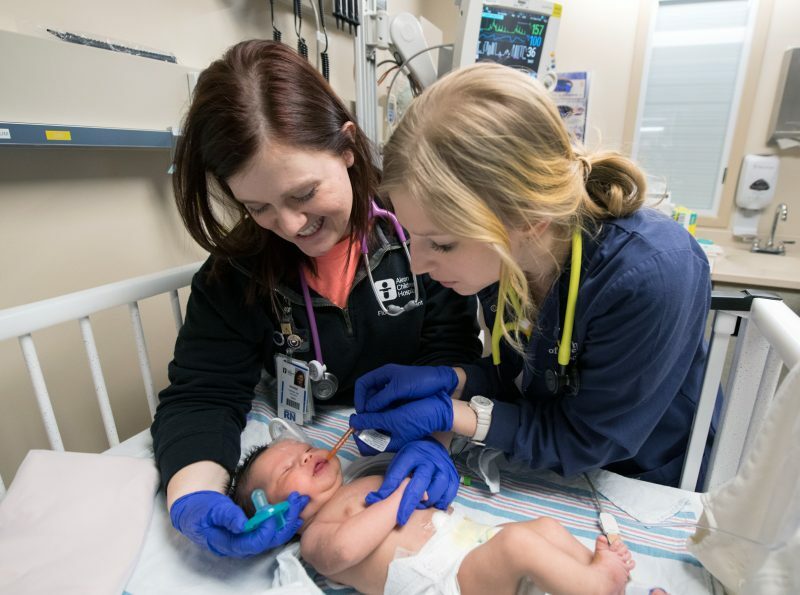 It’s one of the reasons she actively precepts nursing students and also was a motivating factor in her decision to pursue nursing board certification a few years ago. Board certification is the formal process through the American Nurses Credentialing Center that provides patients and families with validation that the nurse caring for them has demonstrated experience, knowledge and skills in the complex specialty of clinical care. Today Renee, a member of the float pool, and her University of Akron nursing student, Kristina Peters, are on the infant/toddler unit, where census is high and the floor is bustling with activity. 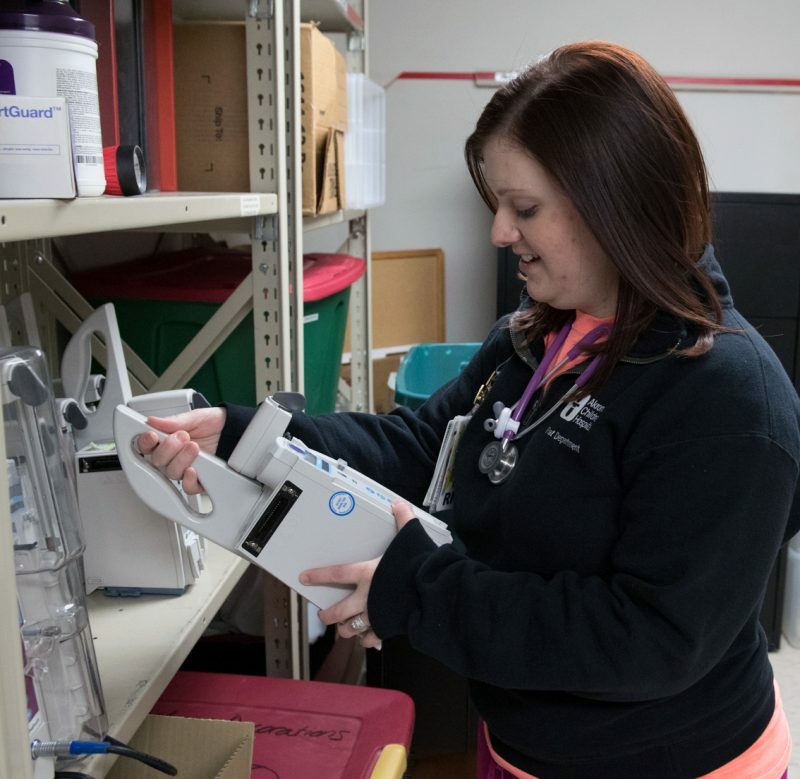 Renee, who started her Akron Children’s career on the unit at Aultman Hospital more than 3 years ago, has been working on the Akron campus for a little more than 2 years. Renee checks Esteban’s vital signs. Her cases today include a 3-year-old child with undiagnosed gastrointestinal issues, a 7-month-old baby with RSV, and 2-week-old Esteban, who was transferred to Akron from St. Joseph Warren Hospital 2 days ago. According to Esteban’s mom, Jennifer, he was throwing up all his feedings and losing weight. 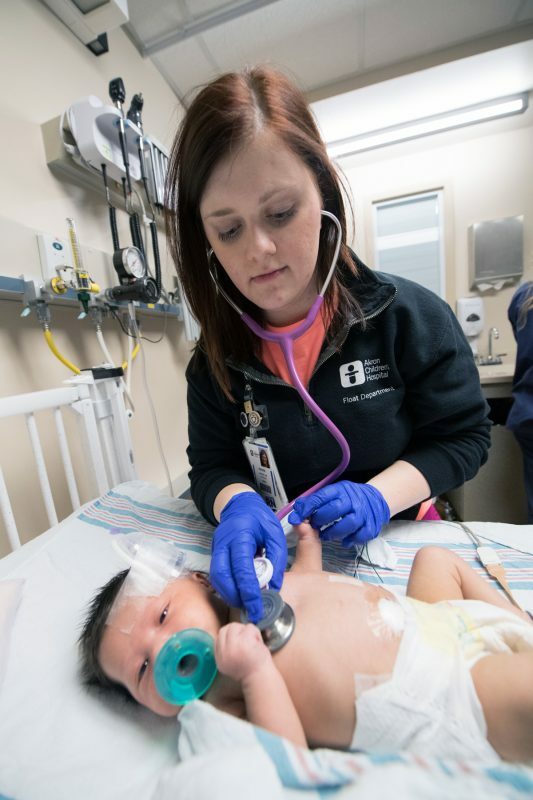 Upon the advice of her pediatrician, she kept him upright after feedings and waited to burp him, but she grew increasingly concerned when his condition worsened and took him to St. Joseph’s ER. An ultrasound indicated he had pyloric stenosis, a condition that affects 3 out 1,000 babies in the U.S. It prevents food from emptying out of the stomach, causing forceful vomiting, dehydration and salt and fluid imbalances. Renee and Kristina prep Esteban’s medication. Renee uses the medication administration as a teaching opportunity, showing Kristina how to program the Nexium through Esteban’s IV pump. Kristina is the fourth student Renee has precepted. While she readily admits it’s a time commitment, it also has added perks for the float pool. 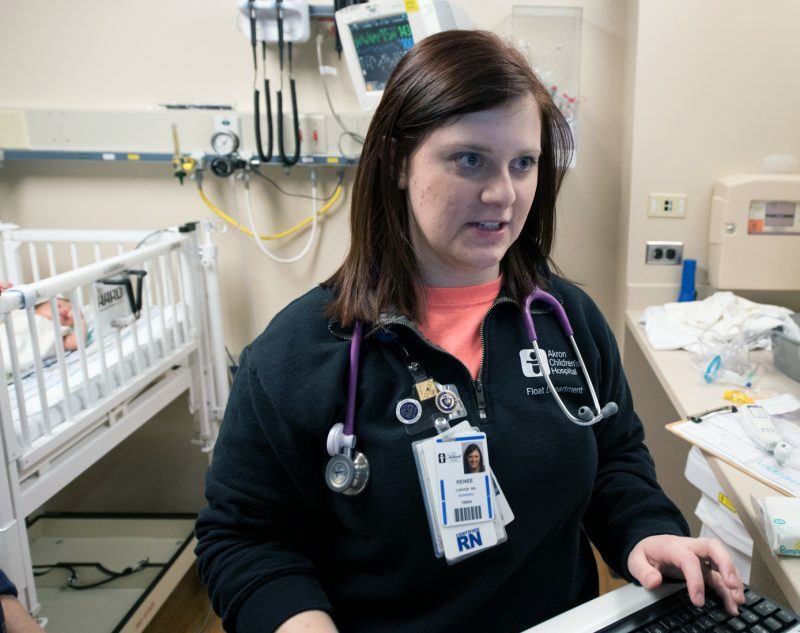 In addition to being a float nurse, Renee is also an Epic trainer — an electronic health record (EHR) system — and spends 2 Tuesdays a month in orientation training new hires how to use Epic. She also spends 3 weeks in April working with Epic trainers, clinical coordinators and primary preceptors improving documentation. Renee updates a patient’s chart. When Renee receives word she’s getting a new patient from the PICU, she also learns his family only speaks Arabic. Renee cites managing her time as the most challenging part of her job. As for her proudest achievement to date, Renee says it was becoming certified. Over the years she’s seen her share of sad cases and difficult family situations, but she’s thankful to have co-workers she can talk to. If you’d like to learn more about how you can make a difference for children and families, visit our job board or follow us on Twitter. Renee gets a pump from the storage room.